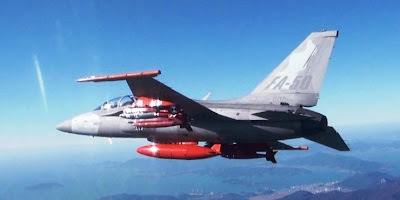 MANILA — A ranking Defense official announced that reviews are being conducted for the South Korea's F/A-50 "Golden Eagle." Fernando Manalo, DND undersecretary for finance, munitions, installation and materiel, said discussions and reviews are now ongoing for the South Korean aircraft. Earlier, a DND observer stated that the Philippines is now on track to operate again supersonic jet aircraft as the "term of reference" (TOR) of reference for the F/A-50 is now in the works. "Procurement for the F/A-50 will be on a government-to-government basis," Defense sources said. They said the go-ahead for the TOR only came recently. The order came from the Government Procurement Policy Board (GPPB), an attached agency of the Dept. of Budget and Management. The observers declined to comment on when the TOR will be completed but stressed it will be done within the year. 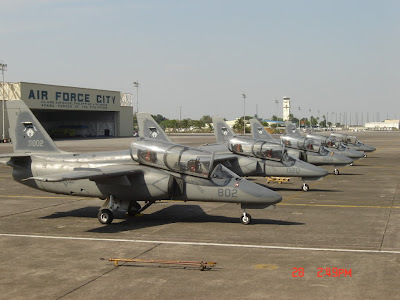 The Philippines is in the market for 12 supersonic trainer aircraft which can double as interim fighter and attack planes for the PAF. It has allocated P18 billion for this program. The GPPB earlier gave the DND the "green-light" to start pre-negotiations with the South Korean government for 12 F/A 50 aircraft last January. The plane is manufactured by the Korea Aerospace Industries (KAI). The F/A-50 is also known as the TA-50. similarities: use of a single engine, speed, size, cost, and the range of weapons. The aircraft can carry two pilots in tandem seating. The high-mounted canopy developed by Hankuk Fiber is applied with stretched acrylic, providing the pilots with good visibility, and has been tested to offer the canopy with ballistic protection against four-pound objects impacting at 400 knots. The altitude limit is 14,600 meters, and airframe is designed to last 8,000 hours of service. There are seven internal fuel tanks with capacity of 2,655 liters, five in the fuselage and two in the wings. An additional 1,710 liters of fuel can be carried in the three external fuel tanks. The F/A-50 "Golden Eagle" uses a single General Electric F404-102 turbofan engine license-produced by Samsung Techwin, upgraded with a full authority digital engine control system jointly developed by General Electric and KAI. Its engine produces a maximum of 78.7 kN of thrust with afterburner.